Bodybuilding doesn't have to be about becoming a mass monster. 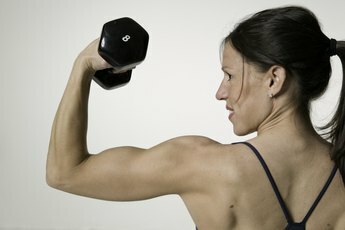 Lifting weights can actually burn fat and help you lose weight and increase muscle definition. Plus, with various forms of female bodybuilding, such as bikini and figure that focus more on aesthetics than pure bulk, you can enjoy bodybuilding training and keep your feminine curves. Rather than just going into the weight room, performing a few random exercises in whatever order you decide is best on the day, plan your workouts in weekly cycles. When it comes to bodybuilding, if you fail to prepare, you prepare to fail. Split workouts are what you'll most commonly see promoted in bodybuilding magazines. Split workouts are generally better for those looking to add muscle, notes strength coach Marc Perry of BuiltLean.com, as they allow you more time to focus on individual body-parts. Try a four-day split where you train your upper body on Monday and Thursday and lower body on Tuesday and Friday, advises Shannon Clark, personal trainer and author of "The Beginner's Guide to Muscle Building." Your other option is full-body training. This is definitely the way to go if your goal is more fat loss or muscular definition, says Rachel Cosgrove, trainer and co-founder of Results Fitness in Santa Clarita, California. Full-body workouts hit more muscle groups, and thus burn more calories and provide a higher metabolism boost. You need at least one day's rest between each workout, so a Monday-Wednesday-Friday or Tuesday-Thursday-weekend day schedule works best. Whether you go for a split or full-body workout, you've got three or four days off each week to take it easy and relax, right? Wrong. Off days from weights are vital for muscular recuperation, but don't rest on your laurels just yet. Cardio is a critical part of bodybuilding. In the off-season it's useful for maintaining body-fat levels while you add muscle, while in pre-contest mode cardio is a must for accelerating fat loss and burning calories. When you're gaining muscle, go for an easy 30-minute jog, walk or swim on your off days. When contest season approaches though, you need to commit to cardio. Perform 45 minutes of tough cardio -- sprint, play sports or hop on the treadmill, stationary bike or stepper and turn it up to the max. Base your sessions around compound exercises -- movements that hit multiple muscle groups simultaneously. These work more muscle fibers, trigger more growth and burn more calories. Pick four or five exercises each session, do a warm-up set or two on each, then go into three to four tough sets of six to 12 reps using as heavy a weight as you can manage while maintaining good form. Aim to add a little weight to each exercise or do extra reps every week.